At Rich Litvin’s coaching workshop that I attended earlier this month (partly to speak there and partly to learn), Rich talked about how he handles coaching situations where he doesn’t know what to say next. He said that when he doesn’t know what to say to a client, he pauses and says nothing. Rich pointed out that this definitely feels uncomfortable, but instead of trying to escape that discomfort and regain a sense of control and certainty, it’s okay to simply rest in that discomfort and allow it to be there. Eventually new insights and ideas will come through, and either the coach or the client can start sharing again. This was one of those a-ha moments for me. Since then I’ve been thinking about other parts of life where I can apply this idea of resting in discomfort. As I’ve been doing public speaking for many years, I trust that the words will always be there. I never seem to be at a loss for what to say next. But I credit this to always being prepared. However, I’ve noticed that with each passing year, I require less preparation for each talk than I used to, and I rely more on the flow of ideas that come to me while I’m on stage. Instead of being in my head remembering what to say, I pay attention to the audience members, the mental and emotional energy of the room, the inspired ideas that are coming through in the moment. These days I speak more from present-moment inspiration than from advanced preparation. I always prepare in advance though. I always have a plan for what I’m going to say. But more often than not, I break from my plan when I speak and just go with the flow of inspiration as it arises. About 10 years ago when I’d give a speech, I’d stick to my prepared plan almost 100% of the time. If I planned to say it, I said it. If I didn’t plan to say it, I didn’t say it. This meant that I was very much in my head when speaking. This is largely the Toastmasters style of speaking. You prepare your speech in advance. Then you deliver it as you prepared it. After a few years of this approach, I began breaking from my plan about 25% of the time. I’d begin each talk as I’d planned, but if a compelling idea came up partway through my speech, such as the urge to tell a different story, I’d sometimes allow myself to go there. I found that these unplanned parts of my talks had extra energy in them and were generally well-received. I also found it interesting that the audiences didn’t know that I’d gone off-plan. Audiences don’t know what I have planned, and so they normally assume that whatever I said was what I’d originally planned to say. Early in my Toastmasters career, I saw a woman give a very eloquent 10-minute speech. I complimented her afterwards and asked her how long it took to memorize and/or rehearse it. She told me that she didn’t — she was just speaking off the cuff. I was impressed that someone could deliver such a clear flow of ideas like that. This gave me a sense of the direction I wanted to go with my own public speaking. When I began doing my own 3-day workshops in 2009, I was still sticking to my prepared material about 75% of the time. By early 2012, it was closer to 50-50. I’d always prepare fully, but I’d break from my plans with increasing frequency. Sometimes I’d even make up additional audience participation exercises, group activities, and games on the spot. If an idea felt inspired to me, even if I’d never tried it before, I’d run with it. These ideas usually worked very well. And no one knew that they weren’t part of the original plan. During the past two years, I’ve gone from 50-50 to about 75-25 the other way, so now I’m only doing about 25% prepared material, and the other 75% includes whatever inspired ideas flow through me in the moment. I’m still preparing 100% in advance, but when I get on stage, I’m only using about 25% of what I’d planned. So naturally I’ve been wondering if it makes sense to plan so much material that I’m not even going to use it. As I step away from preplanned material and speak more from the flow of inspiration in the moment, the energy of my talks has shifted. I speak less from my head and more from my heart. I feel more in tune with the audience. I’m more centered in the present moment. Despite these positive results, I hesitated to go into a speech with no prepared material whatsoever, except in very limited and informal situations. I held the belief that being unprepared and speaking entirely off the cuff was irresponsible. When I prepare in advance, my talks always have a structural backbone. I can break from that structure as inspiration hits me, and then I can return to it and continue with my prepared material as I see fit. In those situations, my inspired diversions are always tethered to my original plan. If there’s no prepared backbone to a talk, I’d have the freedom to go wherever inspiration leads. But there’s the risk that it will lead me down a blind alley. With an article I can always go back and edit mistakes, tighten up the flow, and cut parts that don’t feel quite right. But in a real-time speech, there’s no chance to go back and edit. Rich’s idea of resting in discomfort was the final piece I needed to step into this style of speaking. The truth is that I can’t guarantee that it will work. If I get stuck, however, I can give myself permission to rest in that discomfort until I see where to go next. I can even share that discomfort with the audience. I can pause and invite them to ask questions. If I accept that this discomfort may come up and surrender to that possibility in advance, then I feel little resistance to speaking 100% from inspiration in the moment. It seems like it would be a fun challenge. One situation that comes up occasionally is the opportunity to explore a connection with a woman who’s had some major trust issues in her past, such as lying, cheating, or abuse. This can make it difficult for her to trust people, especially men, but a genuine 3D or 4D connection requires strong mutual trust; otherwise the relationship doesn’t work. On the one hand, I have a lot of compassion for such women. My ex-wife Erin was date-raped at age 17 and then fell into an abusive relationship for 3-1/2 years, and it took her a long time to recover from that. From her I learned a great deal about abusive relationships and the long-term effects they can have on people. I’ve also had my own share of problems with people lying to me, as I shared in the Overcoming Trust Issues article. In the past I’d typically handle these situations in one of two ways. If the woman seemed too distrusting or jaded, I usually declined to get involved with her. Connecting with her can be like trying to pet a cat that claws and hisses at you for your efforts. Why bother? I really don’t need the kind of drama she might introduce to my life. It’s much more pleasant to connect with women who don’t have such negative associations to intimacy. At other times I wanted to help the woman heal. I saw her as emotionally broken and wanted to fix her. This approach rarely had positive results though. In the end, we must choose to heal ourselves. These were strategies to help me escape my own discomfort. Dealing with someone who doesn’t trust me can be very uncomfortable for me. I’m used to high-trust, honest, open relationships where authentic communication is normal and natural. When I connect with someone who doesn’t trust easily or who frequently misinterprets others’ intentions, I feel very out of my element. I want to get out of that place immediately, either by pushing the woman away or by trying to heal her apparent trust issues. I dislike that kind of energy in my life and feel like I need to wash it off afterwards, as if I’ve just been splashed with muddy water from the gutter. The a-ha moment that Rich gave me was to realize that there’s another way to handle these situations. Instead of needing to escape the discomfort, I can allow it to be. I can feel deeply misunderstood and not immediately run away from that feeling. I can allow the woman to be suspicious and jaded and not flee the scene. I can rest in my discomfort without pushing her away and without trying to fix her. I can let her behavior disturb me, bother me, knock me out of my comfort zone. This is something I’m just beginning to lean into, so I’m not sure where it will lead yet. One positive effect is that if someone is “in their stuff” and projecting past hurts onto me, I now have the option to rest in that discomfort without taking it personally or blaming the other person. One area where I’ve already been applying this “resting in discomfort” approach for many years is my vegan lifestyle. This January will be my 17-year anniversary of being vegan. Originally this transition was fueled by curiosity more than anything else. It began as a 30-day trial, and the trial never ended. I’m coming up on day 6,200. Initially I kept going because the mental benefits impressed me. After several months animal products lost all their appeal. I stayed vegan because it felt normal to me. I ate what I wanted to eat. I wasn’t tempted to consume an animal’s flesh or eggs or milk. To me those are all non-food substances, on the same level as mucus, feces, or vomit — not remotely appetizing, regardless of how they’re processed. The thought of putting that stuff in my mouth disgusts me. Not my kind of fetish, regardless of how many people are into it. As I learned more about the environmental and societal effects of our food choices, the ethical aspects of being vegan began to sink in. With those realizations came this rising discomfort. My thoughts, feelings, and beliefs towards animals had taken me pretty far beyond my prior social conditioning. For one, I didn’t feel that there was any meaningful distinction between pet animals like dogs and cats vs. dinner plate animals like pigs, chickens, and cows. Some vegans address this discomfort through activism. The planet is broken, so let’s fix it. Let’s wake people up! Let’s put cruelty behind us. Let’s take the moral high ground and do what’s right, even if it’s difficult. I adopted this mindset too at one time. I’ve attended vegan rallies and have donated thousands of dollars to pro-vegan charities. Others cocoon themselves in a community of like-minded people, so they don’t have as many triggers for the discomfort. For most of the time I’ve been vegan, my approach has been to rest in this discomfort. Allow the feelings to be there without trying to escape them. Every week, meat eaters collectively slaughter 3 billion animals in order to eat their flesh. That’s 3,000,000,000 animals per week! To imagine this on a human scale, it would be like killing the entire population of the United States and Mexico every single day. About 60 million people died in all of World War II — that many animals are now killed for food 7 times per day. The scale of this operation is almost beyond imagination. Beyond the cruelty aspects, this mass daily slaughter requires an insane investment of land, labor, and natural resources. Can you imagine the logistics involved in breeding and killing a population the size of the USA and Mexico every single day? It requires an astronomical investment of water, electricity, fuel, and labor. It also produces more waste products than you could imagine, especially greenhouse gases. Does it make you uncomfortable to know this? Do you care about your role in all of this? Do you care enough to change what you put on your dinner plate? Are you doing what you believe is right… or are you doing what’s most comfortable? It sure makes me uncomfortable. At times it gives rise to some pretty strong emotions. When I see friends eating animal foods, knowing what goes into their production, it pulls on my heart strings. I feel sad for the animals that suffer and die, unnecessarily, to feed the taste for flesh. Depending on what the person in front of me is eating, it may also trigger some nausea. The smell of fish or the sight of something that used to be on the inside of a cow are unpleasant experiences to be sure. If I could change only one thing about this planet, it would be to see humanity stop breeding, caging, and killing animals and to return to a more harmonious, less abusive, relationship with the animals of this world. If I could surrender my life to make that a reality, I wouldn’t even think twice about it. I don’t own any pets, but I find it very easy to connect with animals. I see them as my brothers and sisters. 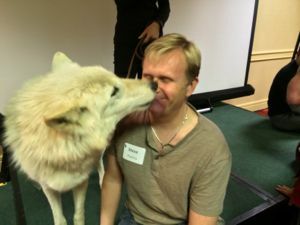 When I’m in the presence of animals, I often feel a special energetic relationship with them. I feel naked, as if they can instantly read through any social mask I may be wearing in the moment and see me as I really am. The thought of caging, torturing, and slaying such beautiful creatures seems unfathomable. 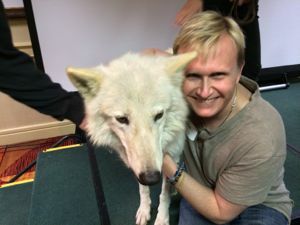 Earlier this month I had the chance to hug a wolf for the first time — the female alpha wolf of her pack. It was a delightful experience to connect with her energy, which felt pure, centered, and curious. There was no fear present in our connection at all. I felt like she was scanning my energy when I first sat down near her. Then she moved closer and let me pet and hug her. Afterwards she licked my face all over. How do I feel when other people relate to animals with violence? It pains me deeply. But instead of running around trying to fix everyone or fleeing from that pain, I allow myself to rest in the sorrow. Sometimes I apologize to the animals for what humanity is doing to them. It can be difficult to surrender to these feelings, but I find that it helps me keep my heart open and be more compassionate. I love this passage and find it to be very wise and insightful. When we close our hearts to hurt, sorrow, and discomfort, we also close our hearts to love, joy, and connection. When we open our hearts, we make ourselves vulnerable to experiencing many different emotions. The same sense of compassion that causes me to feel hurt and sadness when I see how people treat animals is the same compassion that enables me to write from a place of inspiration and caring and to give away so much for free. It’s also the same sense of compassion that allows me to enjoy deep and meaningful relationships with the people in my life. A heart that’s closed to animals must also be closed to people. I’m sure some people will disagree with that last sentence; I used to disagree with it too. Caring is a mixture of joy and sorrow. The two are inseparable. But sorrow needn’t equate to suffering. Suffering is sorrow resisted. Sorrow accepted is emotional growth. Sorrow burns out our emotional impurities. It helps us see what truly matters to us. When sorrow burrows into us, we tap into a more awakened vision of ourselves. Life doesn’t look so small anymore. In the space of deep sorrow, we form our greatest and most expansive intentions. I accept that I live in a world where many people relate to animals — and each other — differently than I do. I could choose to join them in their beliefs and attitudes, but I prefer to rest in the discomfort that I experience. Joining others in the mass slaughter of animals as a way of escaping that discomfort doesn’t feel right to me. Nor does trying to fix a society that doesn’t want to be fixed, especially a society that would only claw and bite me for my efforts. Instead of trying to escape discomfort one way or another, you may find value in resting in your discomfort. Allow it to be there. Surrender to it. Let it carve out a deeper space within you for caring and compassion, even if it sometimes feels like being hollowed out with knives. If you follow your own path with a heart, you may often find yourself in uncomfortable situations. Instead of escaping back to your comfort zone, play around with leaning into that discomfort. See where it takes you. You may be surprised.